Participation at Faire: Playtron at Scarby & Texas Ren Fest. Garbing Experience: Sewing since I was 3, had own sewing machine since 8. Made own halloween costumes starting at 12. 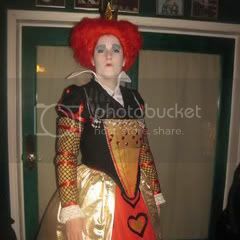 Make my "Shakespere project" for HS was a historically accurate Juliet costume. Make all my formals for HS & Collage. Married an actor and started making costumes professionally. Spent a year over seas working with tutors from the Sydney opera house, academy award winners, and NZ national ballet. Came back to US, and started costuming shows at a local theater. In the mean time have been the garber for every noob who has joined our guild. And resident seamstress for our guild. I'll add a pic later. Joined RF: um...2006 I think, maybe late 2005??? Most of my garb I make myself. I do have some garb from bartering with others. I've been sewing since teenage years, but never took it seriously until diving into the Faire world. Now I do outfits for myself and for others along with my continuous leather shoe work, which is challenging and rewarding at the same time. My outfits run from semi accurate to total fantasy. Hey it's all in the name of comfort and fun for me. Participation At Faire: I attend Gregor's Crossing, Casa Loma, and hopefully this year FaeryFest and Bracebridge. 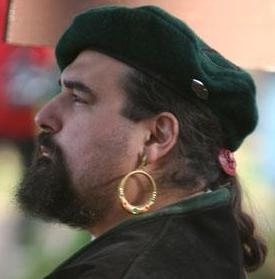 Former patron of the late Ontario Renaissance Festival. Garbing Experience: I started hand sewing as a teeny wee child with my grandmother who quilted. I never got into it though until after my first summer at faire. I started out with FaireWear for myself, my sister and her friends, then discovered a passion for historically accurate costume. In the past two years I've been working on historically accurate outfits for the faires I attend with what seems to be success. And I never leave a seam unfinished anymore! I have been sewing since the early 70s. 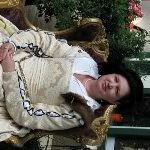 I have been researching and making historic costume since 2002 for myself (please to note the ME FIRST!) and members of my family. 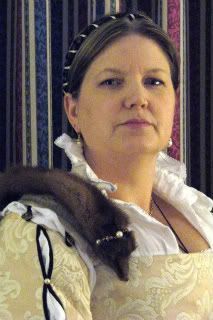 Any historical costuming from 1300 to 1945 interests me, but, right now, I am primarily focusing on the time periods 1300-1350, all of the 16th century, and 1730-1780. Turn-ons: Historical Accuracy. I have a particular weakness for period portrait interpretations - the more the interpretation looks like the portrait, the better I like it. I find it ever so helpful to remind me what I did the last time! Garbing Experience:Began sewing at 14. Sewed costumes for my children for years, including several princess dresses and a mermaid. Started garbing for fair in '96 with daughters costume. Have intention to eventually have a booth at fair selling children's costumes and other handmade items. Sew all of my family's costumes not H/A but we all love them anyway. Gradually striving for more accuracy but financial constraints limit the amount I can spend. Have just been accepted into nursing school so my next 2 years will be focused on that. My husband Graybear is usually attired as a barbarian of sorts. Just look for the fat gray haired lady in red and chances are you'll find me! 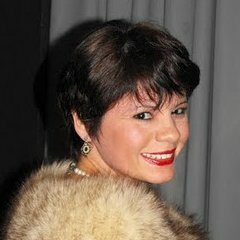 Name: Cilean Stirling At Your Service! H/A or J/F: I tend towards Historically Accurate than Fantasy, but I dabble in fantasy when I can. Participation at Faires: Interpretor for the Deaf as a Stage Interpretor for the larger Faires, with So Cal Faire mostly. I am a playtron now. I am also an SCA persona I have been invovled with the SCA for 24 years. Garbing Experience: I began sewing when I got married and wanted awesome garb but had to live on a budget. I began with my first book and some basic cotton, next I was given help from some awesome people and just have been wrangling fabric ever since. Upcoming Project: A gown from a portrait of May Queen of Scots. 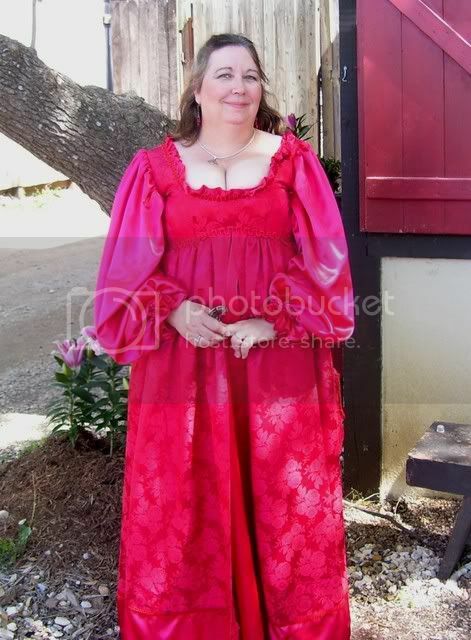 I am currently working on a 'Summer Tourney Gown' for the SCA. Participation At Faire: Paytron at the now closed down Ontario Renaissance Festival. I'll be a paytron at Casa Loma this year. Garbing Expereience: Very Novice. I'm working on my second garb and I made pirate garb for my son for Halloween. I've been technically sewing since 1991 while in junior high, but I was lucky I didn't sew my fingers together . About 5 years ago I decided I wanted to learn to sew the things I really liked so I bought a sewing machine and learned to sew again. Garbing Experience: Have adjusted many things, made a few hats, hemmed a kilt (to keep from fraying). Made a couple of scabbards and Baldrics. Random bits of leather work, mostly adjusting ebay purchases. Wife has done most of what makes me look good. If I take this apart what will happen?? Particpation at faire: Just a playtron. Been going for 8 years to TN. Went to KY last year and GA this year. Garbing experienceGrew up learning how to sew. If you wanted school clothes you made them. So the move to garb was rather easy. I've made my husband and my garb. My biggest challenge was a bodice from the directions from the old forum. Joined RF: I have been lurking for a while. Can’t remember the date I began. Let's just say I am new. Garbing Experience: I have been making garb for about 5 years now. I make garb for myself, my daughter and occasionally friends and family members. I try to journal my sewing projects on http://goodgirl73.livejournal.com/ and post pics and blogs on goodgirl.renspace.com. I hope to have a web site someday. Joined: Late 2007? I think? Some time around there. I was lurking for awhile before I actually signed up. Participation at Faire: Currently I am a playtron at the Washington Renaissance Fantasy Faire. I have also been a vendor (gamer? I worked the balloon fencing booth) at MiRF, a playtron at the Marshall Mayfaire, and a show performer at the Saline Celtic Festival, the Howell Balloon Festival, the Bay City Tall Ships Festival, and a Celtic Festival I've forgotten the name of in Mo. Garbing Experience: Made a skirt with my Mom's help when I was a little kid. Didn't touch sewing again until college, when I helped my Mom make my first set of garb. The following summer, I made a shirt-the first think I had sewn by myself-without using a pattern. Since then, I have only made one piece of clothing where I have not modified the pattern, or made my own pattern. Most of what I have sewn has been garb (much more fantasy or "ren faire correct" as opposed to h/a) or halloween costumes, though I've been thinking about branching out into everyday wear clothes. I also have a bad habit of not starting projects soon enough, which leads to unfinished hems and the like, but I'm starting to get better about that. And one of these days, when I have successfully put fresh batteries in my camera, I may actually have pictures of me in garb. The closest I have is the picture from my main intro, which is a sci-fi suit of armor I made (not reposting that here, cuz it's not on topic). Joined RF: 2006? Don't remember. Participation At Faire: Playtron. Last year I visited: PARF, NYRF, MIRF, MDRF and a few smaller faires. 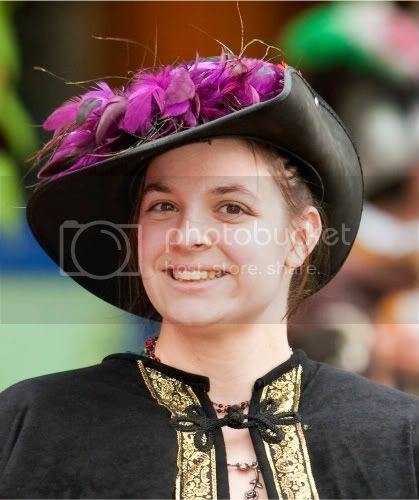 I also attend Pennsic. Garbing Experience: My mother was a good seamstress but I never touched a sewing machine until three years ago. 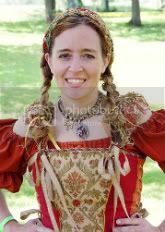 Started with simple faire skirts and chemises, went to Pennsic and then I got the bug bad. I've made early Florentine gowns and am working on a venetian (see photo sans sleeves and hem). 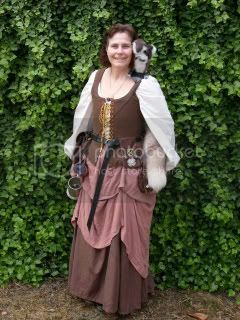 I've got a loooong "to sew" list which includes a woodland fae outfit, a later Florentine gown and a complete pirate outfit. I've also made my own beaver fur pouch and learned that metallic electrical tape gets guard hairs off a pelt in a snap! You haven't had enough coffee unless you can thread a sewing machine while it's running. 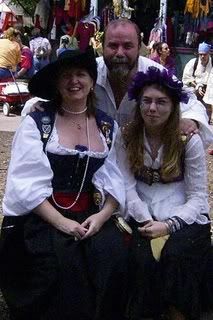 Joined: Summer of 2005, after a disasterous first faire garb... oh lordy disasterous... destroy-all-evidence-disasterous. 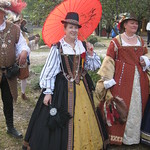 Participation at faire: Am part of "Have Court, Will Travel", the Royal Court at the Des Moines Renaissance Faire since 2006 (when it moved to a permanent location). We are also the court for the new Dubuque Faire (may 31, June 1 this year!!! Don't forget!!!! ), and have worked both the Nebraska and Iowa Renaissance Faires with our Boy Scout troop crossbow booth since spring of '05 (missed NebFaire this month, due to scheduling weirdness). LOOOOOOVVVEEEEE FAIRE!!!!!! Time to get back to sewing!!!!!! !